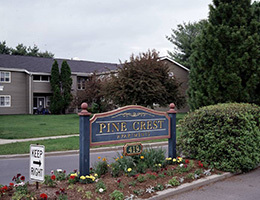 Pine Crest Apartments is a pleasant, safe 114-unit community located in a country setting. One, two, and three bedroom apartments contain oversized living rooms, large bedrooms, walk-in closets, and a balcony or patio. Four bedroom townhouses are also available. There is also an onsite Resident Service Coordinator to assist residents with a wide range of services and referral information as well as full time property management, maintenance and grounds crew. For your convenience, units contain appliances, including a dishwasher, garbage disposal, and refrigerator. Laundry hook-ups are in the three and four bedroom apartments. Pine Crest has ample parking, and is conveniently located close to shopping, schools churches and library. There are laundry rooms in each building and heat and hot water are included in the rent! Pine Crest has a pool, tennis court, basketball court and a playground. 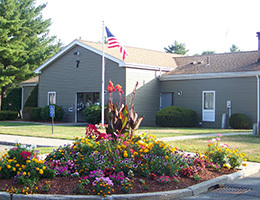 The New England Affordable Housing Management Association has recognized Pine Crest as a Community of Quality. A Community of Quality is certified as having achieved a high standard of excellence in the way they are managed, the services they provide residents, the experience and training of personnel, and other criteria. Pine Crest is a smoke-free community and grounds.